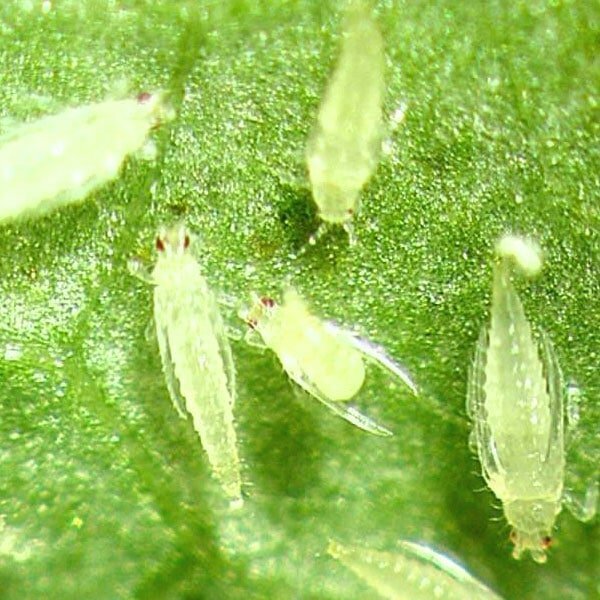 There are more than 6,000 thrips species sucking the life from plants all over the world. Get rid of them naturally without resorting to toxic sprays by using these SAFE, organic methods. 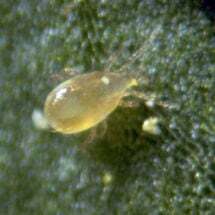 A common pest found in greenhouses and indoor/ outdoor gardens, thrips damage plants by sucking their juices and scraping at fruits, flowers and leaves. Plant leaves may turn pale, splotchy, and silvery, then die. Injured plants are twisted, discolored and scarred. Adults are very small (less than 1/25 inch) straw-colored or black slender insects with two pairs of feathery wings. Without the use of a hand lens, they resemble tiny dark threads. Extremely active, thrips feed in large groups. They leap or fly away when disturbed. Host plants include onions, beans, carrots, squash and many other garden vegetables, and many flowers, especially gladioli and roses. Both adults and the wingless larvae are attracted to white, yellow and other light colored blossoms and are responsible for spreading tomato spotted wilt virus and impatiens necrotic spot virus. Adults and pupae overwinter in garden soil. In spring, newly emerged females insert eggs into the tissues of flowers, leaves or stems. (They do not need to mate for reproduction.) Each female can produce up to 80 eggs, which hatch within days in warm weather or weeks to months in colder weather. They become wingless larvae (nymphs), which feed on plant sap. After two or more nymphal stages, many thrips drop to the soil to pupate. Emerging adults fly to the plant and repeat the cycle. There may be 12-15 generations per year with the entire cycle from egg to adult requiring less than 16 days in warm weather. Thrip management is a matter of garden maintenance — reducing the places where thrips may breed — and requires removing plant debris while it’s still on the ground and green. Thrips lay their eggs in slits they cut in live plant stems. Vigilance — spotting problems early and responding to them — is also required. Check your plants for damage and clusters of the pests at the place where leaves are attached to stems. Don’t wait to take action. Take the measures listed below. And be sure to use the safest, most proven products. 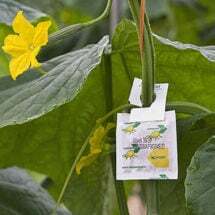 Inspect all plants you import into the garden for signs of thrips or their damage. Discard any infested plants by securely bagging and putting in the trash. 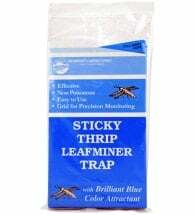 Blue sticky traps are helpful for monitoring adult populations. 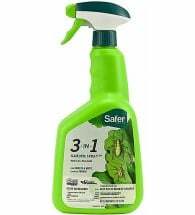 If found, use the Bug Blaster to hose off plants with a strong, encompassing spray of water to reduce pest numbers. 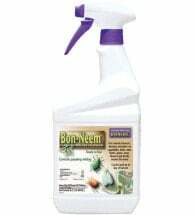 Release commercially available beneficial insects, such as minute pirate bugs, the effective thrips predator (feeds on eggs and larvae before they can become adults), ladybugs, and lacewing, (especially effective in green houses) to attack and destroy all stages of this pest. For best results, make releases after first knocking down severe infestations with water spray or other method. Severe populations may require a least-toxic, short-lived botanical insecticide (pyrethrin) to reduce pest numbers. Follow-up with predatory insects to maintain control. 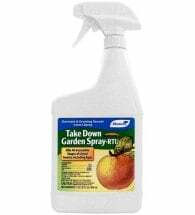 Safe, smothering insecticidal soaps made from naturally occurring plant oils and fats, are also effective for knocking down heavy infestations (and won’t harm most naturally occurring beneficial insects). 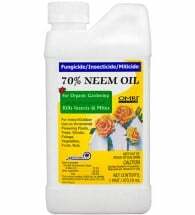 Spinosad and neem oil can be used to spot treat heavily infested areas. 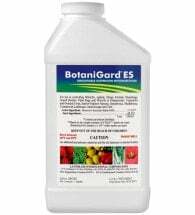 Tip: Thorough coverage is necessary when using natural contact insecticides, especially on the undersides of leaves and where leaves attach to stems, a favorite place for thrips to congregate.